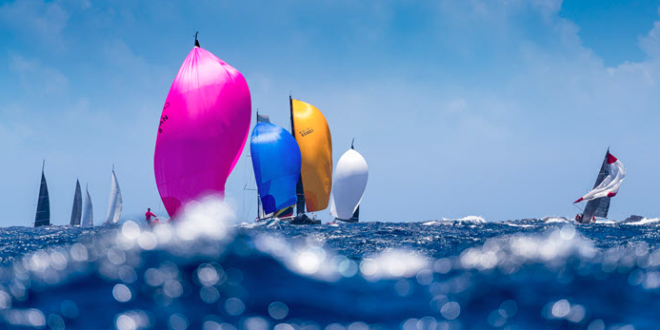 Saint-Barth (April 10, 2018) – After an epic start off the Port of Gustavia for the second day of racing at Les Voiles de Saint-Barth Richard Mille, the fleet went on a wild ride up the southeast coast. With winds gusting upward of 25 knots, the fleet of 53 teams battled it out in frantic surf. At the end of the day’s races, which included a 23-mile course for the CSA 3 Classes, a 32-mile loop for the CSA 1 and 2 Classes, and then a 39-mile course for the Maxi 1, Maxi 2, OMA and CSA Multihull, the fatigue was evident. In these upwind conditions, the crews played leapfrog and while downwind they flirted with top speeds while holding on tight and hoping for nothing to break. “It was sporty!” summed up Thierry Berry (teammate aboard Gordon’s, the Baltic 50 Swiss Jurg Koning), on his return to the dock, echoing the word of the day. The conditions played no favorites today, impacting the amateur and professionals. Notable is Peter Harrisson’s 72-foot Maxi Sorcha, which exploded three spinnakers in less than 20 minutes in the first half of the course on Race 1, leaving the field open for his most formidable opponent, George Sakellaris’ Proteus. While Michael Cotter’s 94-foot Maxi Windfall began the day in first in the Maxi 2 Class, they fell victim to their close competitor Dutch Verder and Van Nieuwland’s Aragon. “We already battled together last year for the top spot, and it is a safe bet that this will happen again this year,” said one of the owners of the Aragon, the Marten 72. Perhaps, unless Ambersail comes to play spoil sport. In fact, the VOR60 of Lithuanian Arvydas Paunksnis clearly sails well in the big breeze and long runs and he will certainly not miss his chance if it presents itself. No fleet escaped unscathed, whether in equipment or crew. Onboard Conviction, the TP52 skippered by American Steve Travis, one of the team members injured his shoulder while he was at the top of the mast. Nevertheless, his crew shone today by finishing with a 30-minute lead over their next competitor. “We did not see the others today. We pushed the boat hard and we made extraordinary speeds upwind. At times, it was a little much to manage to keep the boat on its feet but we did well, “said the skipper from Seattle who along with his crew, finished the race first on corrected time. Today’s performance gave them an impressive jump in the standings today, moving from seventh to third place overall. “We’ll have to hold on and make no mistake to beat Albator and Lazy Dog,” said Travis, impressed by Sergio Sagramoso’s Melges 32’s and Frantz’s impressive performance. In the Multihulls, again the conditions were as much a competitor to face, causing breakages that led to retirements. One victim. Gilles Lamiré’s Multi50 La French Tech Rennes St-Malo, withdrew due to a mainsail issue. “It’s a shame but the good news is that the problem is now fixed and we will try to catch up tomorrow,” said the skipper Cancalais, winner of The Transat bakerly 2016. Despite another strong performance by American Lloyd Thornburg’s Phaedo, a Gunboat 66, they remain in second overall. Sitting in first is Guyader Gastronomie, skippered by Christian Guyader. “In the type of conditions we had today, a boat like Phaedo is better suited than us because it manages to go fast upwind in a rough sea. The latter has made the navigation chaotic but the great downwind runs have been fabulous,” said Guyador’s Arthur Le Vaillant, who will be found at the start of the next Route du Rhum – Destination Guadeloupe next November at the helm of a Class40. The sailors quickly forgot their aches and pains after a hard day of hiking in the big waves once singer Jimmy Buffett announced a surprise concert this evening. 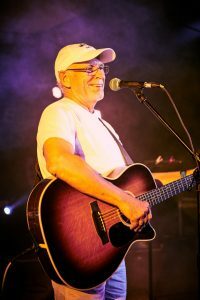 Buffett, this year’s US ambassador, treated the regatta to live music dockside in the Race Village. Racing begins at 10 am tomorrow for all classes. If conditions are favorable, Jean Coadou, principal race officer, and Luc Poupon, race director will make the call to send the Maxi Classes (1 and 2) then the Multihulls (OMA and IMRR) on a 47-mile course between the islands of St. Barth and Tintamarrein to vie for a new award: The Richard Mille Record Trophy. The new trophy will be awarded to the first Maxi and Multihull boat to finish the distance course. Their race will also be scored as one race within regatta, with the ratings and corrected time to apply. The ninth edition is planned for April 8-14, 2018.